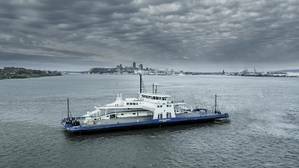 Canadian operator Société des traversiers du Québec (STQ) has taken delivery of MV Armand-Imbeau II, a new environmentally friendly, 92-meter-long ferry built by Chantier Davie Canada. The new vessel will operate on liquefied natural gas (LNG) fuel, enabling STQ - Québec Province ferries operator - to minimize the environmental impact of its operations. The decision is also in line with the Québec's Maritime Strategy, which seeks to protect the integrity of the province's river and marine ecosystem. Wärtsilä, who has fitted a broad scope of its solutions on the vessel, said its experience and capabilities in delivering a fully integrated system comprising the dual-fuel engines, the fuel storage, control and supply system, and extended project management, was the key factor in the award of its contract. "At the Société des traversiers du Québec we are committed to protecting the marine environment in which we operate. For this reason, we were the first ferry operator in Canada to welcome a LNG fueled ferry in 2015, and following this current delivery, we still have a third LNG ferry on order. All of them feature Wärtsilä equipment. Apart from their LNG systems, their technology allows us to operate year round, despite the ice conditions," said François Bertrand, interim CEO of STQ. Wärtsilä previously supplied the dual-fuel engines and LNGPac system for MV F.-A.-Gauthier, the first LNG fueled ferry owned by STQ. It was built in Italy and delivered in 2015. "Once again, Wärtsilä's unique ability to act as a single-source provider of products, automated systems, and integrated solutions delivers real value to both the owners and the shipyard," said Wilco van der Linden, General Manager, Cruise & Ferries, Wärtsilä Marine Solutions. "The depth of our experience in providing LNG solutions is unmatched in the marine industry, and our advanced technologies are designed to overcome the operational cost and regulatory compliance challenges that operators face today." The full scope of Wärtsilä's supply comprises four Wärtsilä 20DF dual-fuel engines, the Wärtsilä LNGPac fuel storage, control and supply system, an Integrated Automation System (IAS), the Power Management System (PMS), the electric drive system, the Wärtsilä communication and control center, on-site management and project integration engineering. The ferry will operate on the Saguenay river on the Tadoussac-Baie-Sainte-Catherine route. It is capable of carrying more than 430 passengers and 110 cars or 16 tractor units. Icebreaking capability will allow the ferry to operate year round. "This delivery marks a shipbuilding milestone as it is the first LNG fueled ferry ever built in North America. We are very proud to have succeeded with this project, and we thank Wärtsilä for its excellent support in making it possible," said Jared Newcombe, Chief Executive Officer, Chantier Davie Canada Inc.
Davie President James Davies commented, "It would have been easy to build a normal, diesel-powered ferry but instead Québec decided to pave the way in setting a new environmental standard for the entire continent. We inherited this project when we acquired the shipyard in 2012. With the project already at a mature concept stage when we arrived, we received a specification from the client of more than four hundred pages long and we immediately set to work on solving the puzzle that had been created." Ron Pearson, Davie's VP of Engineering, added, "From the outside, this ship looks like any other ferry but from the inside, it is of a similar level of complexity to a space shuttle. It is a densely packed, highly integrated and complex product. This ferry has more systems and automation onboard than an offshore drilling platform or a modern warship. It is truly a technological marvel - the cryogenic processes involved in managing this highly volatile fuel, while also creating a vessel which is safe to carry passengers, has been a huge challenge. Integrating all of these systems into such a confined space was even more challenging and one we are very proud to have overcome." The final commissioning of the vessel took place at the Davie shipyard in June 2018, and the vessel was delivered July 17.